A team of students from Australia – A1 Racing – crowned F1 in Schools World Champions recently, were given a day to remember when Formula One boss Bernie Ecclestone presented his World Champions trophy to the team, a collaboration of students from Pine Rivers State High School, Brisbane and Phoenix Community College, Victoria. 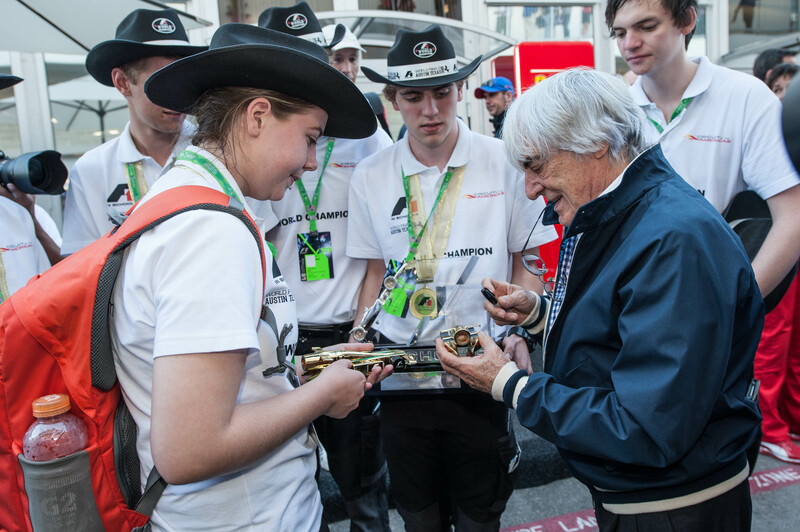 The six 17-year-olds created a media scrum when Bernie showed great interest in their world-beating scale model F1 racing car and gave the A1 Racing team members advice on how to start a career in Formula 1. A1 Racing is led by Team Manager, Beau Gieskens 15, with team mates, Jacqueline Cunningham, 16 (Manufacturing Engineer), Luke Meredith 17 (Marketing Manager), Ben Marshall 17 (Development Engineer), Sam Young 16 (Collaboration Co-ordinator), and Dylan Sexton 17 (Design Engineer). The F1 in Schools World Finals 2013 was held over four days with 38 teams from 22 countries brought together for the biggest challenge of their life, competing for the prestigious Bernie Ecclestone World Champions trophy and coveted automotive and motorsport engineering scholarships to City University London. The F1 in Schools programme operates in over 40 countries. Each of the National Champions and runners-up are invited to compete at the World Finals and third placed teams are invited to participate by forming a collaboration team, linking with a runners-up team from another country. F1 in Schools tasks students to design a model compressed air powered F1 Car of the future using CAD/CAM engineering techniques. Cars are then manufactured on a CNC machine. Each team of between three and six students brings together their portfolio of work to present to a judging panel with a verbal and written presentation to support their model car. The cars race on a 20m track with the cars covering the distance in just over one second, a speed barrier which is yet to be broken by any student team since it was set by Team FUGA from Northern Ireland at the 2007 World Finals with a time of 1.020 seconds. « Newey and Ainslie to pair up?